Facebook, the future of Virtual Reality? Facebook, the social networking company, has recently made some additions to its portfolio, some very “different” additions. First Facebook goes on to purchase the drone company, now though, the company has entered a deal worth 2 billion USD with the virtual reality company, Oculus Rift. 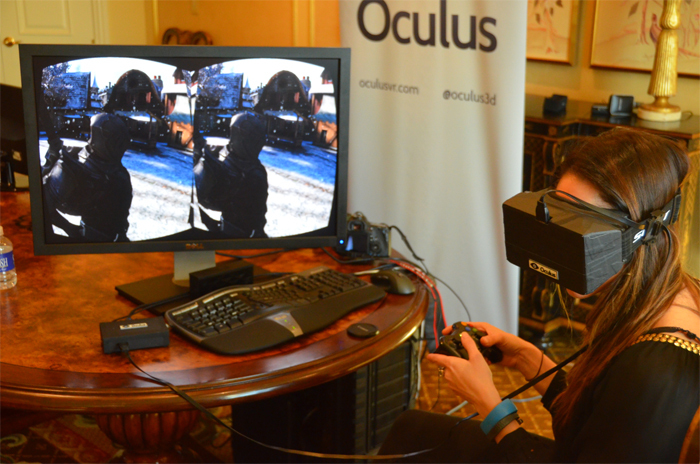 The deal involves Facebook giving Oculus 400 million USD in cash and the rest in the form of shares. But that’s not what this post is about, this information can be found virtually (pun intended) anywhere else on the internet. So we here are taking a look at what we believe is going on in Mr. Zuckerberg’s big head and the response from people who initially funded Oculus V.R. on Kickstarter as well as its supporters. One thing we know for certain, experts think that virtual reality is the future of gaming hence we believe that Mark Zuckerberg is placing his bets on these analyses and hoping to cash in on the future’s next craze. The idea that virtual reality is the next big thing was also fueled further by SONY’s announcement of their take on virtual reality, Project Morpheus. Now whether or not VR is the future is still anybody’s guess but the technology has come a long way and has definitely impressed us. Now a big company is behind Oculus with its enormous funding and support, so what could possibly go wrong? “Facebook” seems to be everyone’s answer. The initial response to this buyout has been mostly negative, early backers as well as most of the gaming community have taken to social media to express their displeasure towards this move. A highly notable instance of Facebook hate was shown by the creators of the popular game Minecraft where the creator refused to develop Minecraft for Oculus because Facebook is “creepy”. They (including myself) want facebook nowhere near the development of VR, facebook plus the future of gaming equals a disaster.Why? It is simply because of the fact that Facebook could potentially possess the most advanced gaming tech in the market and spoil it with its adverts and other modifications. Just imagine Facebook adverts in VR! Farmville in VR……(Kill me now). The company has tried its hand at grabbing audiences outside of just its social networking site by pushing a mobile device made with “the Facebook experience” in mind but that did not go well for them. The same could happen here, if Facebook tries to integrate itself into VR, we might just see the technology die once again. A Facebook experience is just not the right formula for any device. A Facebook experience is just not the right formula for any device. So what is Zuckerberg thinking? Oculus’s co-founder recently stated that the two companies would operate independently with facebook being a source of funds and medium for networking with suppliers. This sounds more plausible, Oculus could become the company it had the potential to be a lot faster than before without interference from the big brother with the paycheck. If the development of Oculus goes on without hindrance or unwanted “modifications”, we could see a new era in the world of interactive video games. First things first though, Oculus needs to regain the trust and support of its initial Kickstarter backers and the gaming community. The easiest way to do that would be to give an official statement of their future plans and the involvement of Facebook in them. That way everyone would know where things are headed and therefore accelerate the development of VR. At the end of the day though, the future is uncertain. Facebook might not interfere in the realm of VR at all and may be the technology might just not be a hit with consumers. The priority for the company right now is to do some damage control and explain clearly what is going to happen over the next few years. Now all we have to do is wait and pray that VR does not end up swimming with the fishes again or hope SONY can redeem the hype with Project Morpheus.